Children have the power to make our world a happier place! Amparo & the Braves: Amparo Albacete Cremades is an enthusiastic teacher of English at a Spanish primary school, CEIP Magraner School in the town of Tavernes de la Valldigna in Valencia. Her 27 pupils there, aged between 7 and 8, are the “Braves”. Amparo and her class are on a mission to learn more about the things that make them happy. Their list is a long one, and among other things, it includes “the sea” and “sea turtles”! This was the springboard for their quest for knowledge. They sought out information on the internet, made a plan, and got in touch with us. The plan: Amparo and the Braves made a colourful paper doll, Happy Paw, and they ‘booked him a ticket’ to Athens and another 27 European cities as well! His mission was to gather as much information as he could about the sea, sea turtles and Athens. Once he had everything he needed he would be on his way home to Spain. Happy Paw arrived at the MEDASSET office in Athens determined to carry out his mission. The situation was looking serious. It was clear we needed urgent help. So we alerted Chrysoula Alexopoulou, a teacher at the 7th primary school in Galatsi. 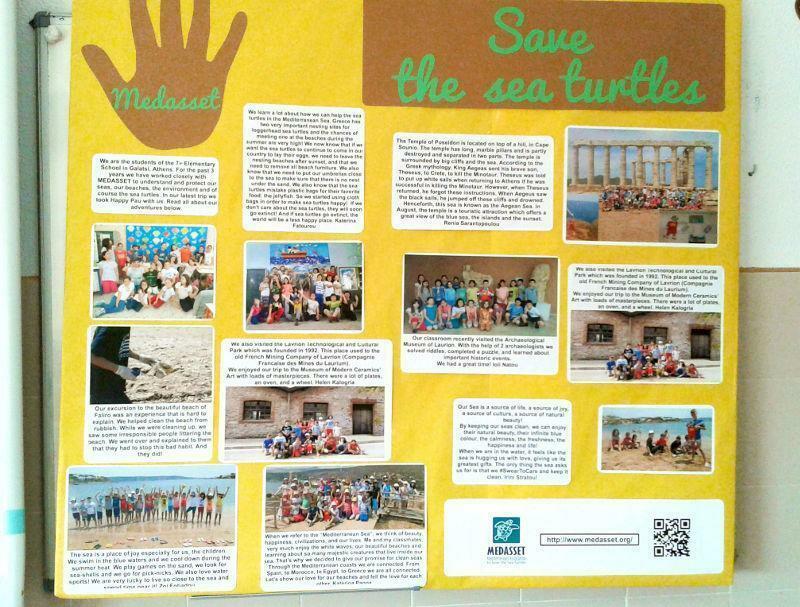 An active and engaged teacher, Chrysoula and her enthusiastic class had taken part in all MEDASSET’s educational programmes over the last 3 years and they had also organised actions and events aimed at protecting both turtles and our seas. But would they be able to help? Happily, they responded immediately. They joyfully welcomed Happy Paw and took him with them on all their school trips, showing him all the beautiful beaches of the Attic peninsula and the historic monuments that can be found there. They took him all over the place! He went to Cape Sounion National Park, the Technological Cultural Park in Lavrio and the temple of Poseidon. They showed him the lacy shores of Attica and took him along so that he could give them a hand with a beach clean-up they had organised in Faliro! In class they talked about everything they had learned about the Mediterranean and the sea turtles and showed him the wall they had decorated with their creations: there were turtles, octopuses, jellyfish, dolphins, and a big ship to carry them on their travels. They asked Happy Paw to make his own promise as part of the “Clean Seas: Swear to Care” campaign and finally bade him farewell and sent him off to carry all that he had learned back to Amparo and the Braves. So Happy Paw came home to the small town in Valencia loaded down with all the new experiences, photos, posters and memories that he had gathered on his long journey, and anxious to share his news. 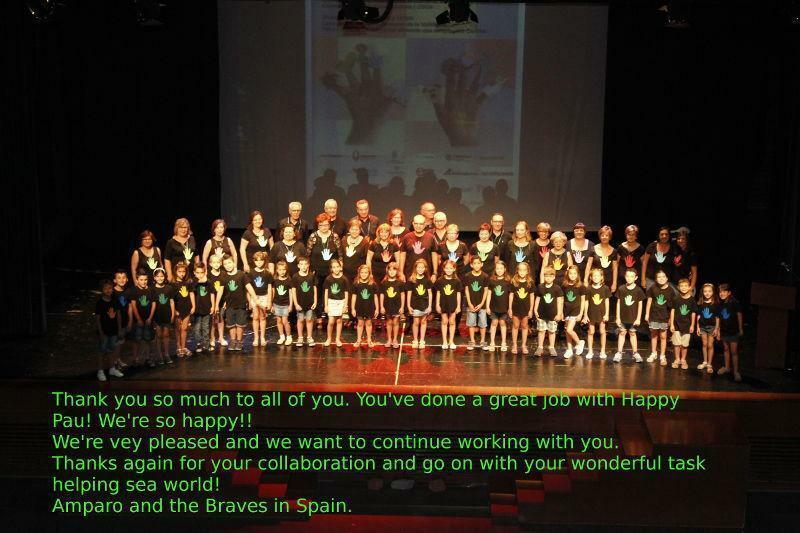 Amparo and the Braves held a tremendous celebration and went on to present the tale of Happy Paw’s travels in 28 European countries. It’s undeniably true that children can make our world a lovelier, more joyful and happier place through their creativity and imagination especially when they have the support of talented teachers like Amparo and Chrysoula!